Gaining in popularity, the yucca plant makes a beautiful floor accent year-round. Many cultivars are available to choose from. 'Variegata' leaves are broadly edged in white... and 'Silver Star' has silvery gray-green leaves. Yuccas are available as either stemless leaf rosettes or as stout, cane-like trees with one or two leaf rosettes at the top. Young plants are stemless rosettes of long, sword-shaped leaves with pointed tips. 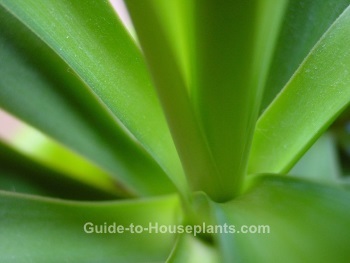 As they mature, yucca plants develop thick, woody trunks with several arching leaf rosettes at the top. The edges of these leaves are spineless, and not as sharp as others in this genus, giving Y. elephantipes the common name Spineless Yucca. Place a young plant on a pedestal plant stand to show it off. Older plants make a bold architectural statement in any room, so put one in a spot where it will get the attention it deserves. Those pointed leaves punctuating the air are something to admire. 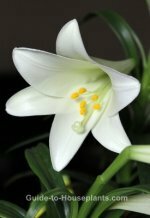 This plant is extremely easy to grow and is tolerant of changing conditions throughout the year, such as light, humidity and temperature. You can move your yucca plant on the patio for the summer months where it will get some direct sun every day. Outdoors, it may produce tall spikes of fragrant, white flowers. One thing it doesn't tolerate is soggy soil. Stem and leaf rot may be caused by overwatering or by cool, damp air. Keep this desert native on the dry side, especially in winter. Repot in spring when the plant becomes root-bound. Use a heavy container to prevent toppling, because older plants are top-heavy. Older plants can be top-dressed instead by replacing the top 2-3 in (2.5-5 cm) of soil with fresh soil. Light: Prefers bright light to full sun, although it will tolerate low light. Water: Keep soil moist in spring through fall. In winter, water just enough to keep soil from drying out. Be careful not to overwater, especially in winter. Use a container with drainage holes to prevent soggy soil, which can cause root rot. Humidity: Average to dry room humidity. Temperature: Average room temperatures. If you scoot your plant outdoors for the summer, it can take the heat, but bring it inside when temps drop to 50°F/10°C. Fertilizer: Feed with a balanced liquid fertilizer every 2 weeks in spring and summer. 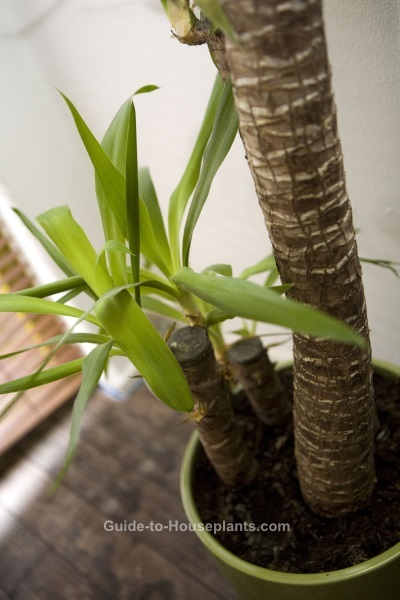 Propagation: Cane cuttings and offsets root easily. Pot them in potting mix and keep barely moist.